Summer is busy. The gardens have gone from lush to munched. The deer have taken liberties and the gardener has been lax with the spray program. Still, there is beauty to be found in the shortening summer days. Shadows are lengthening and the late flowering shrubs and perennials are starting to bloom. Above, the Caryopteris is attracting bees. I think this one is Caryopteris x cladonensis 'Bluebeard'. The honeysuckle has both berries and blooms right now. This one sits by the fishpond along with a Heuchera 'Caramel' which is languishing in the hot sun. The butterflies don't seem to mind the scorched leaves. I have moved this Heuchera to a better site just this week. The real star of the garden at this time of year is the Hydrangea 'Limelight'. This 'Limelight' sits in a back corner of the garden behind the house. I really must add a few more to more visible areas. It lights up the garden at dawn and dusk and this hydrangea will never let you down. It blooms easily and heavily in my Zone 5b garden. Yes, I need to get a few more. The sunny days have a definite and discernible brightness signaling to the garden and the gardener that it is time to get busy. This weekend was brisk and light filled even as the ice still covered the fish pond. The maiden grass is looking tattered and torn having suffered a very early and heavy snow in October and many swirling winter winds. We have had just a couple very cold days this winter. There has been little snow cover compared with last year. In addition to the golden glow of the grass which compliments Tucker's blond coat, the moss is almost impossibly green. Along the drive there is a newly planted witch hazel, Hamamelis x intermedia 'Arnold Promise'. Arnold is starting to wake up. It may be a whole month until spring but here brightness and light are returning. There will be slips back to winter. It is inevitable. That said, there is a touch of yellow in the garden. Is your garden showing the signs of a new season yet? "Among the considerable numbers of things that separate Southern gardens and gardeners from their counterparts in colder regions of the United States is the prevalence of blue plumbago." 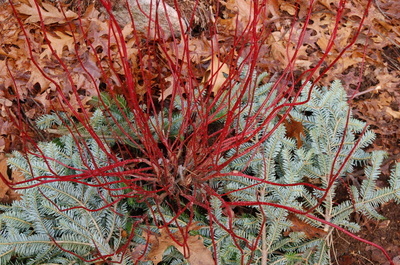 many of us purchased these shrubs from local nurseries with the promise of blue. Many of us were often disappointed as these shrubs would leaf out with abundance but fail to flower most seasons. I say most seasons because every few years there would be a slightly warmer winter or enough snow cover to protect the tender flower buds and the blue flowers would arrive albeit sporadically. This just added to the confusion of the novice gardener or non-gardener who planted these shrubs. Why the flowering some years and not others they would ask themselves not understanding the tenderness of the flower buds. A hydrangea which does not flower is a coarse, uninteresting blob in the border. Enter Hydrangea macrophylla 'Endless Summer'. 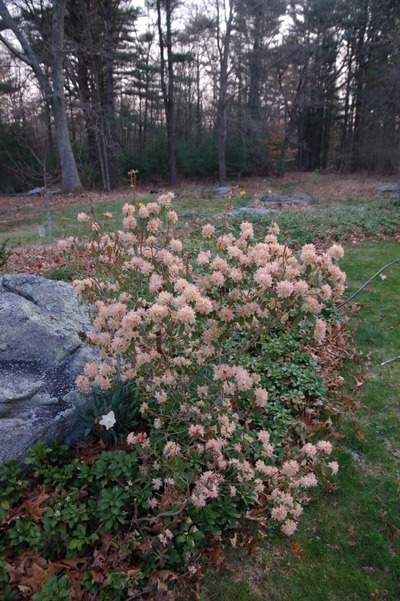 Blooming on new wood, these shrubs produce new flower buds in the spring. and we in the north now, consistently, have blue hydrangeas. I should also mention that due to Mr. Lacy's high praise of his blue plumbago, I recently picked one up to use in a container planting. I am admiring its' blue, phlox like flowers with their dark veining. What blue do you have in your garden? Not purple, true blue. The leaves of this Acer j. 'Aconitifolium' have dropped and the cool days of November are upon us. November can be so gray and bleak in New England. 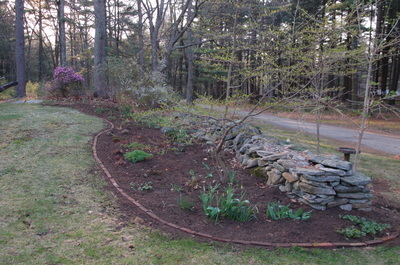 This past weekend was leaf raking weekend and so the garlic remains as yet unplanted and the beds untidied. The bulk of the leaves have been carted to the compost piles but the windy day left the lawn littered yet again with scattered spots of oak leaves. The statuary needs to be put away as cement does not fair very well with the freezing temperatures of New England. This birdbath will freeze over if left and Buddha must spend the winter in the shed. Mickey Mouse was a favorite of my dear Aunty Hope who passed away this year. He needs his own garden but what would you put in a Mickey Mouse garden? He sits among the hellebores currently but they are a bit over his head. has not succumbed and will be moved, hopefully this weekend, to the basement. Under lights of course. It seems impossibly green in this ever browning landscape. Are you snuggling under for the season or is it in full throttle in your area? 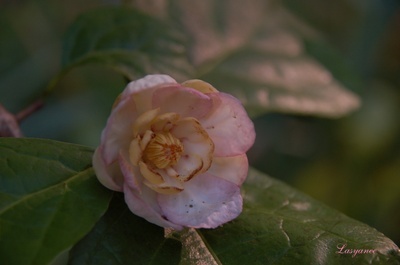 The Chinese wax shrub, Sinocalycanthus chinensis, lives up to its' name. 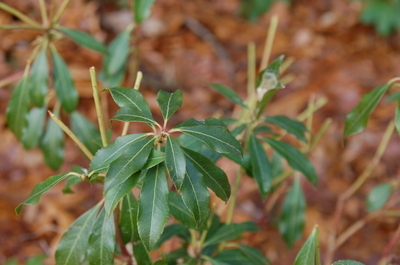 The leaves are shiny or waxy to the eye and while this shrub was planted just last fall, it is already one which I check often for signs of deer browse and flowers which are just opening. They are small, about an inch across, but they do have a magnolia like appearance don't you think? 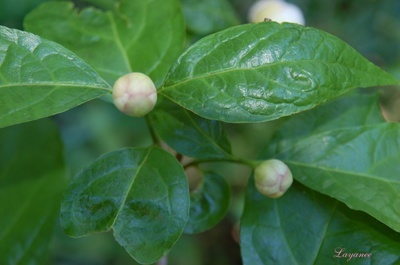 This shrub is hardy to Zone 4 and has been in cultivation in North America only since the early '80's. I like the flowers and the buds are pretty but this shiny foliage is worth a second and third glance and only time will tell what the ultimate form of this shrub will look like. Is anyone else growing this shrub and what do you think of it? 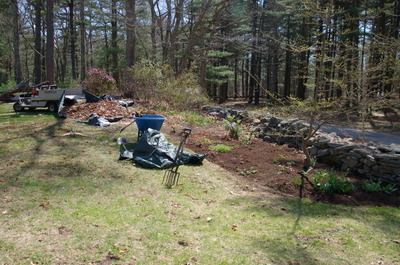 Progress continues on garden cleanup and the above border is being cleaned and compost spread. There is a Styrax 'Pink Chimes', which is a lovely little tree, in this border. The trunk is a bit curvy and is visible on the right side of this picture. I think that the heat wave is over which is a blessed relief for all flowering plants. A spring rain is predicted for the next few days. It hasn't rained in well over a week and with soaring temperatures, high of 84 F, the spring flowering trees, perennials, and bulbs just don't last very long. 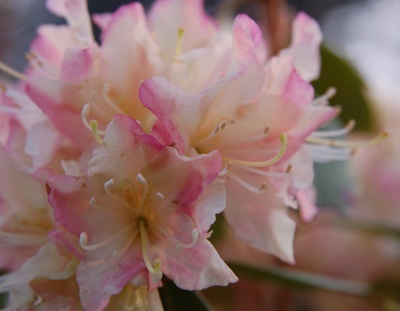 One of the small leaved rhododendrons which is now blooming in my garden is Rhododendron 'Mary Fleming'. I could go into Mary's parentage but lest your eyes glaze over I will just say that she is a pastel princess dressed in pale yellow blooms which have just the slightest tinge of pink on the edges. The leaves have a bronze cast to them throughout the summer and they gain a little more color through the winter. Isn't she pretty? I can't remember her blooming so thoroughly and giving so much satisfaction to this gardener. Perhaps she has attained that age where she is now a bit more well rounded and filled out, more seasoned. Another blooming lady is Prunus 'Hally Jolivette'. 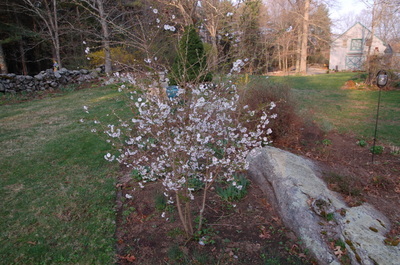 This is a small tree or shrub which blooms for a two to three weeks. 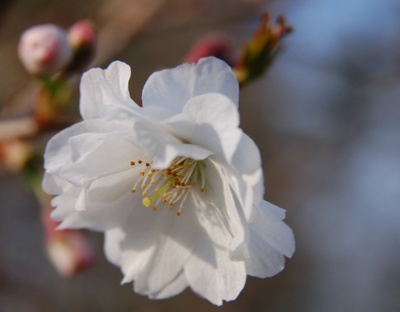 It has the typical Prunus flower but this shrub continues to bloom because all of the flowers do not open at once. It likes to be a shrubby tree but here I have pruned it to three stems and will give it a bit of a haircut once blooming is finished. 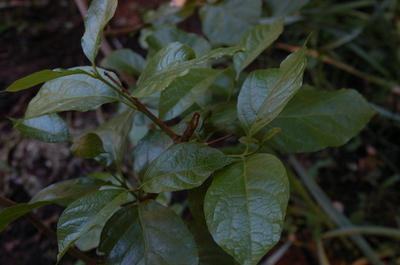 This is listed as a fast growing shrub and this one has been in the garden about three years. I like it better each year. 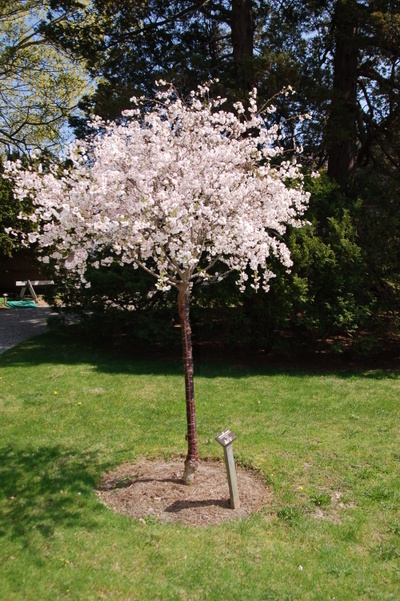 As Prunus go, this one is disease and insect resistant so if you have a small space you might consider this shrub. It can get to fifteen feet but it responds well to pruning. 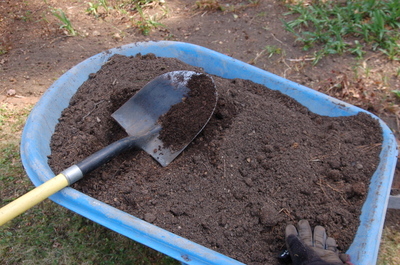 It is hardy to zone 5. I spotted this Prunus 'Hally Jolivette' at Blithewold. It is clearly high grafted to a standard rootstock but it was a lovely little lollipop on the edge of the drive. Which do you prefer? Here is the 'Pink Chimes' border all ready for a gentle spring rain. 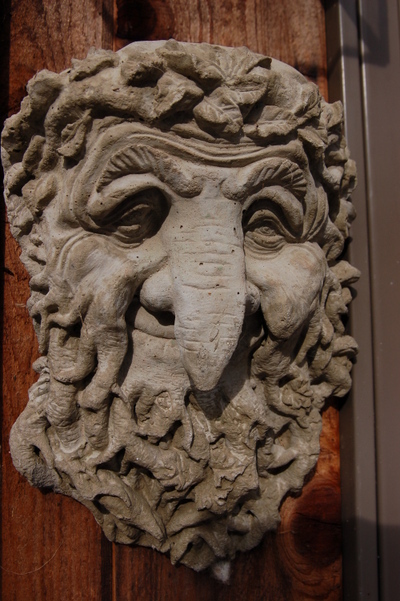 For those of you who asked about the creature by the door, here he is in his full glory! He is called Man of the Woods and with a nose like that he could not possibly be female! I like his gnarly beard and wise eyes. 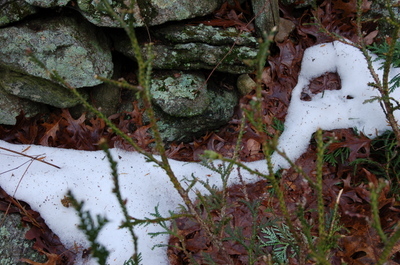 This Sunday was a balmy 39+ degrees and much of the snow, especially in the south facing areas, has melted. 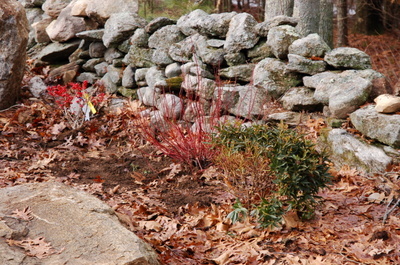 Since I purchased my after Christmas special shrubs, three of each of the Ilex verticillata 'Red Sprite' and Cornus stolonifera 'Arctic Fire', I was forced to either heel them in a pile of mulch or find a spot and plant them. The Equipment Manager, bless him, checked the ground in the new border and found that it was not frozen. 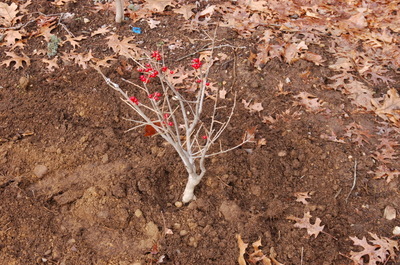 He proceeded to dig six holes and we planted the shrubs, frozen root balls and all. Since they would sit in a nursery in a container, they should be fine planted out in the border. I have never planted in January before! 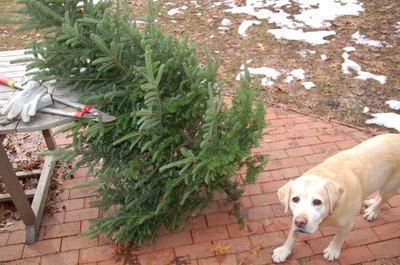 I did take the Christmas tree down and one of the advantages of a live tree is that the branches can be cut off and used as a mulch to keep the ground from freezing and thawing. 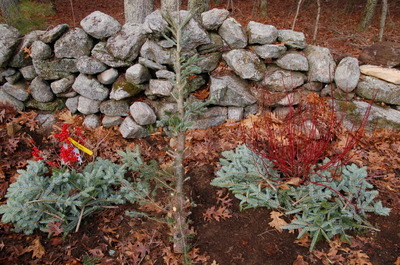 I had assistance with this task, as you can see and the newly planted shrubs look quite cozy with their collars of fraser fir. 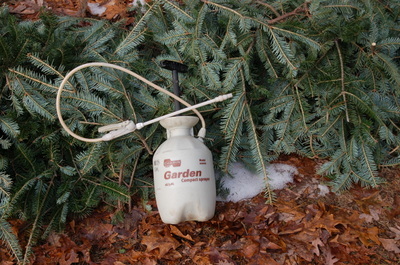 Of course this necessitated getting out the deer spray since deer love fraser fir and despite my efforts have nibbled on many of my plants. They even nibbled the Pieris or Andromeda which they are not supposed to like. I wish someone would tell them that! 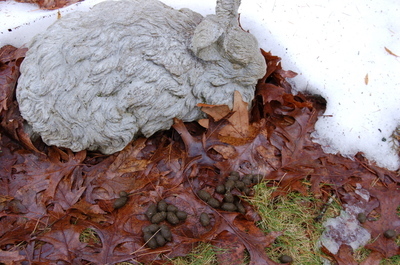 These look like bunny droppings but this bunny hasn't ever left any such treasures! On an added note, I would love to have you comment and I do have a few more posts for this week but I will be away on vacation and will respond to the comments when I return.